Colin and Aimee, avid New Orleans Saints fans, reflect on the tough losses their team has experienced in the playoffs the last two years. It was something like 17 degrees below zero in Minnesota that day, a good 70 degrees colder than it was back home in Louisiana. I was basking in the glow of an amazing Theology of the Body weekend in the Diocese of Duluth. 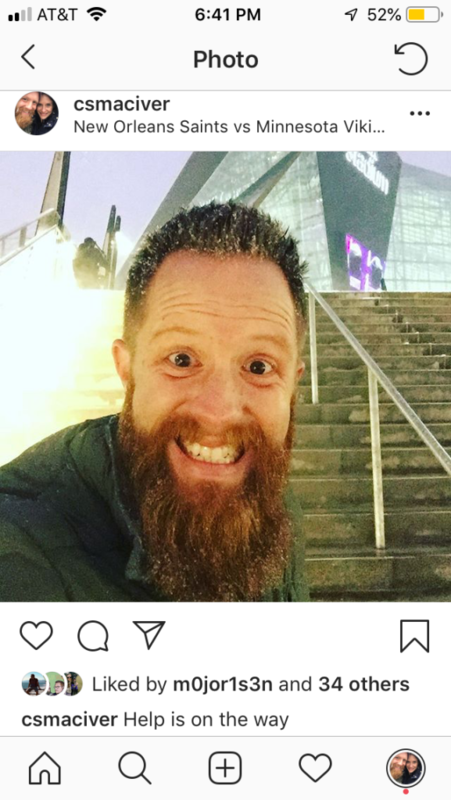 Thanks to their invitation I just so happened to be in Minnesota for the New Orleans Saints’ divisional round game against the Vikings and I scooped up tickets. Finally getting to my seat, I peeled off several layers so I could sport my black and gold jersey and a giant number 9. Once I settled in I noticed the sea of purple jerseys around me as my neighbors happily spun towels at my head … not good. I looked up at the scoreboard … also not good: 17-0, Vikings. Not good at all. 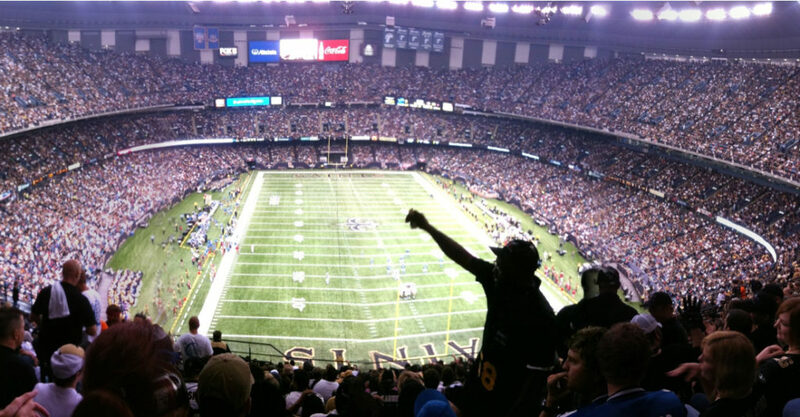 I was the lone Saints fan in my section and the quest stood on the edge of a knife. Things looked grim. I reached into my pocket and grabbed the only weapon I had … my rosary. I started with a Chaplet of Divine Mercy. Four decades in … touchdown, Saints! As I finished my chaplet, major defensive stop. Things were looking up so I started the Joyful Mysteries of the Rosary and watched a comeback unfold. I moved onto the Luminous, Sorrowful, and even Glorious Mysteries. Twenty decades later the Saints had the lead. I felt a bit like Moses in the battle against Amalek. I could hardly believe it. As soon as I showed up and started praying the Saints made an epic comeback. The Vikings fan behind me who kept tapping me on the shoulder and telling me that, “Drew Brees is average,” got really quiet. The next day, sporting my black and gold in the Minnesota airport was a bit like being in the receiving line at a wake. Everyone from the TSA agent to the barista made eye contact and said, “Sorry for your loss.” Being there was bucket list awful—and still, I’m so glad that I was there. Being a Saints fan has taught me how to celebrate a win, and we’ve had plenty of those, and how to weather a loss, even the nightmare inducing loss we are weathering right now. I think this is something that being an invested and committed fan can teach us. The world didn’t end on January 14, 2018 or on January 20, 2019. Last August, six months after that frigid day in Minnesota, I found myself at Saints training camp on a 96-degree day when a reporter asked if my son Leo and I would be willing to say some words for a piece on the evening news. I noted that I was there in Minnesota for the heartbreak of the tragic snap six months earlier, and that I was there to, “reignite a light of WHODAT hope.” Today, in spite of an even more hard-to-swallow defeat, that flame, an analog for a more important flame, isn’t snuffed. Sports are an analog for human striving and human striving requires resilience, lots of it. In 2011, when we were developing our Middle School Theology of the Body program, Brian Butler and I got to spend some time with Joe Lombardi, the Saints’ quarterback coach and grandson of Vince Lombardi. Joe’s almost monastic sense of discipline, commitment to prayer, and clear mode of communicating were striking and inspiring, even though he asked if I was a soccer player when he saw me throw a football. It wasn’t hard to see how he and Drew Brees are a natural pair. He noted that winners are controllers who act upon what can be acted upon with a clear vision of what is outside of their control. He pointed out the importance of habit and became the spokesperson for our session on virtue. Oh, and he, along with many others in the Saints organization, is a devout Catholic. Mrs. Gayle Benson—owner of the Saints—and her late husband Tom Benson (former owner), have been patrons of more than football. Here in the Archdiocese of New Orleans the Bensons have done more than I know to support the mission of the Church and put on a clinic of inspired stewardship. The Saints, named for the saints in heaven, are another outward sign of the beautiful paradoxical Catholic gumbo of my beloved New Orleans—and when they win, the teach us to rejoice in bigger victories. When they lose, they teach us commitment, perseverance, and hope. When they lose and you’ve prayed all of the mysteries of the Rosary and a couple of chaplets, they teach you that we don’t preach a prosperity gospel and that Saints are often forged in the fires of heartbreaking defeat, like our beloved Joan, patroness of our city. I was absolutely sure we would win today. Which isn’t really like me—I’m like Jason Bourne, always scanning for danger (and in other ways, too, but I don’t want to intimidate you), so I’m wary even in games like the regular season Eagles contest (43-7 win, by the way). But not this one. Not today. Today I didn’t doubt. Today I literally hopped off a bus I’d been riding on with my students for twenty-four hours into a waiting car to rush immediately to the Superdome in time for kickoff. But before that, I had a string of prayers answered, dominoes that lined up. On our way out of town, I prayed that our departure wouldn’t be delayed waiting for food, and astonishingly someone at a small local pizzeria made one hundred pizzas in an hour and was willing to deliver them to a shrine. I prayed that we could travel all the way from DC and beat a snowstorm and traffic without a moment of delay, and so it happened. As I prayed for all the variables to line up—and they did—I was sure, absolutely, that today we would win. I prayed for green lights through the city and they appeared. I prayed for sunshine so we’d be able to park on the street and walk from the car to the Dome, and the skies were clear and blue. I prayed to find a fruit cup in the NFL stadium concessions and a kiosk appeared among all the nachos and sausage. When it happened—The no-call—I felt the familiar urge to panic, but I told myself: not today. All those little prayers weren’t answered just to sit here and hold broken hearts in our hands. Most of all today I prayed: Jesus, let us have this memory together. Let us have this memory together as a family. It would mean so much to us. And like everyone else in this city whose heart is always a little broken, I prayed: Jesus, Drew deserves this. He’s meant so much to us. Just one more to show him how thankful we are. Sometimes an athlete kicks a ball on the field and in the same moment kicks out your breath. A gut punch. Like all gut punches, the more unexpected they are, the more they level you. Defeated. Heartbroken. In disbelief. It’s just so final. It just happened so fast. On the way back to our car, we walked behind a man who was scream-cursing his bitter disappointment in the most vulgar terms. At first I thought: Yeah, me too, bro. But he kept going and with my son next to me asking what he was saying, I had enough. “You better save that, there’s kids all over the place,” I shouted at him. His girlfriend quickly apologized and tried to shush him. This led to a conversation with my son about how to handle bitter disappointment. He asked me if he could throw something and I said no. “Why do you want to throw something?” I asked him. We didn’t really say anything else. But I pondered the words that just fell out of my mouth for that long walk back to the car, past lots of the most broken parts of New Orleans. We walked past some neighborhood kids playing in a dirty lot near some broken houses. They were playing football in the dark. Laughing and laughing. You can be sad without destroying something. Your heart can be broken without breaking your soul. Your city can be a place where people suffer gut punch after gut punch but still have Mardi Gras. One prayer was answered today: we have the memory to share as a family. We have the memory to share as a city. Not the win. Not what Drew or any of the boys deserved. Not the magic that we wanted. But maybe what’s more important is that we have family to share it with. Aimee and Colin MacIver are co-authors of Power and Grace: A Guide to the Catholic Sacraments, TOB Teens Middle School, and The Parent and Sponsor Guides for Chosen: Your Journey Toward Confirmation. Colin is also the author of the Quick Catholic Lessons with Fr. Mikecompanion. Both are graduates of the Franciscan University of Steubenville and teach at St. Scholastica Academy. They live in Covington, Louisiana with their two children, Leo and Zelie. Colin is host of the TightRope: Reflections for Busy Catholics podcast.